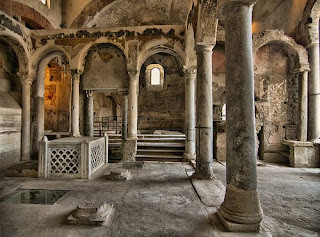 Veloce ® cycling and bike rental company : Archaeological cycling itineraries in Italy - Cimitile early Christian site. Archaeological cycling itineraries in Italy - Cimitile early Christian site. Italy is not only Pompeii archaeological site. Our company are working to create new cycling itineraries around antique hinterland areas of Vesuvius. In effect in this region We have a lot of precious sites that need to be recovered by the tourism. For this raison in the first week of April Jerry will fly to this region for meet local associations and for study all details of new touristic cycling offer. An example : ride by bike in this area and visit early Christian basilicas of Cimitile, priceless oldest site of Pompeii, built in the fourth century before Christ. This site is close to Naples and Vesuvius area.